Finding a hotel in the Clearwater – St Pete's area is tough because there is so much choice and in the US this includes motels, apartment rentals, all the way up to massive resort hotels like the Sandpearl or the Hyatt, which are very close to Pier 60. This is still a fairly new addition so prices are reasonable for the large rooms and incredible views. When I walked into my room on the 6th floor my jaw literally dropped for about 20 minutes because of the insane view of the beach. Yes, you can also see the pier and from the second window – yes I had an end of row room with two stunning windows – I could see the docks. There is not a bad view here. A few moments later as a boat whizzed by I was pointing like a small child seeing Micky Mouse for the first time, unable to speak. Sadly Little Toot let me down on my first night as the weather closed in and I had only an hour on the beach before the lightning started. The beach itself is heaven, a little crowded for some, I found it reassuring with my fears of jellyfish, sharks etc. to see families around me. When the weather closed in it was three minutes walk, if that, back to the hotel, a hot shower and a mission to find some food. The hotel boasts a lively bar – Jimmy's Crow's Nest – a bit too lively for me in terms of the volume of music, but with an incredible view of Clearwater. Unfortunately it also closes at the first hint of a storm for safety. The room was just as luxurious as my Hilton pad, with a small sofa where I could chill out and check out the incredible view – also stunning during thunder storms and when the moon made an appearance, massive king size bed, coffee maker, huge TV (which did not get switched on) and a slightly more appealing bathroom with a walk in shower (with several massage functions), plenty of towels and much better toiletries – lime and coconut – yum! Also handy mouthwash, which I always love in a hotel. 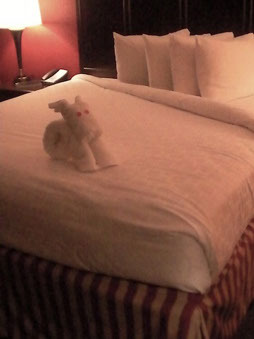 The piece de resistance however was the towel animal (not sure if it was a dog or rabbit) that appeared the next day – I fell in love with him and found it really hard to leave – the guy at the front desk told me to sneak him into my suitcase but I couldn’t. All in all this was perfect for me as I didn't want to stay in a resort hotel after 6 days at the Hilton Orlando, or a motel or apartment. The view was worth every penny, great bed, great bathroom, great service and handy information from the front desk. Breakfast was included; good coffee, muffins, (exceptional raspberry pastries), toast, cereals, yoghurt, slightly questionable looking burgers and potato patties (which I avoided) but I really need a high protein breakfast in the morning to keep me going and eating pastries and muffins gave me a hollow start to the day. The hotel also has a small, cute pool with a lovely view of the docks, where I spent a good time on my last morning enjoy a few rays before my Little Toot trip. The hotel also has car parking – around $15 a day – not much different from the metered parking across the street, but nice to know your hire car is secure. Also you have to use your key card to access the hotel floors (apart from the top floor with the bar) so you don't have to worry about any bar guests wandering around (very good!) Beach towels are free to borrow from reception as long as you sign them back in and there's a tiny guest shop for flip flops, sun cream and hotel baseball caps. Oh, and a little tip, a great place to watch the sunrise is just behind the pool, where you can literally sit on the dock of the bay. Don't forget that the light makes an appearance and then, just when you think it’s all over, the sun pops up.